If you’ve been an artist for any length of time, it’s likely you’ve been asked by a nonprofit to donate your work for an art auction. Traditionally, nonprofits host art auctions using donated works because it is a proven and profitable model of fundraising. However, against their best intentions, it is undermining the very community that is helping them. This fundraising model negatively impacts individual artists and the community alike. Organizations often solicit artists for donations with the promise of exposure as a benefit. There are many reasons artists donate their work—mainly to support nonprofits they truly care about—but also to engage new audiences. So, exposure sounds like a fair trade. Getting in front of new audiences always seems like a great opportunity for future sales. Unfortunately, overwhelming feedback from artists reveals that the exposure does not convert into sales later. This means that exposure isn’t a strong enough selling point for artists to give—especially if the exposure leads collectors toward subconsciously devaluing the artwork. Bidding on art is like saying, “I’ll give you whatever I perceive it is worth.” That’s the thing about art: its value can be difficult to place. When artists give away art, the perception can be that it is worth nothing. Even the Government agrees. Artists aren’t allowed to write off a donation on their taxes, only the cost of materials. When an artist continually gives away their work, it reinforces the perception of the starving artist. It is extremely common for work to be sold under market value at an auction. Artists who sell work below its value decrease the value of the work previously sold to collectors — your work should be going up in value, not down. It’s also common for a nonprofit to have more work than they can sell in one evening, so the work is frequently sold at a lower price because the supply was higher than the demand. Artists must set a precedent to be valued at all times, no matter what. In the long run, artists who do not value their work at a living wage are hurting themselves and other artists in the market. What about the art community as a whole? What are the broader implications of selling art through this channel of buyers? When a buyer has an opportunity to buy art at whatever price they believe is equal to the value they perceive, then they are able to purchase the work at whatever value they claim. Selling work for less than its value could potentially replace art collectors with art opportunists. Why would we want to cultivate a community of patrons who want bargain prices? We must support the actions to cultivate collectors who respect the time and talent of artists. How can artists and nonprofits collaborate to create a mutually beneficial relationship? Many artists have a naturally giving heart, so it’s important to define the model of giving for their art business ahead of time. Then, it becomes clear to the artist how to collaborate with nonprofits going forward. Artists who want to grow a healthy collector base in partnership with a nonprofit must communicate their value to potential collectors. 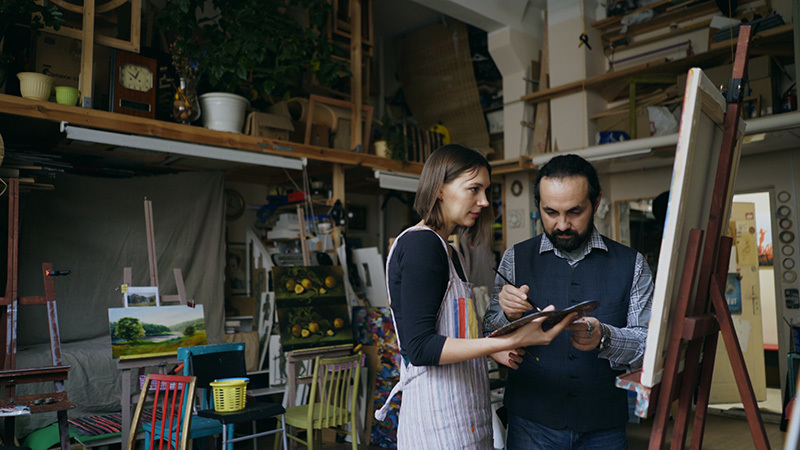 This is essential for increasing the value of their work overtime with collectors who connect with the artist from the start. Turn the request around. Offer to be the featured artist at the event and to do a live paint or demo. You’ll have a chance to meet potential collectors, auction the painting live for a percentage of the sale, and increase the value of the experience overall. Ask current collectors to purchase your work at its full price and then donate the work to the auction to receive a tax write off. This enables the artist to make their wage, collectors to receive a full write off, and nonprofits to resell the art and keep the auction price as the donation. Create an experience. Offer an afternoon at your studio to discuss their story and art process over coffee, tea, or drinks. This enables the artist to directly connect with potential collectors. Invite the patron to a private viewing of your work that will be on exhibition in the future. This creates a special experience for the artist and potential collector. Offer a limited exhibition on loan for a public space. Offer a showing of your private collection. Offer a class. This will enable the patron to experience what it requires to create a work of art and the artist is able to make new connections. Offer to host a group art crawl and give a tour of your local art district. This would enable the artist to meet a group of potential collectors and captivate their attention. Offer to be a guest speaker about your work at an event in the future. Develop a partnership by donating a percentage of future sales for a limited time. The difference between donating art and creating a value exchange is the experience. The goal is to elevate the experience and think about connecting the artists with the local community in a new way. We must shift toward a new model that strengthens and builds the artist community while still supporting nonprofits. Too many organizations rely on artist donations for fundraising and they may not even realize it. It’s not a sustainable or healthy model for growth for either party. We need to always find ways to create more value, not less. Have a generous heart, but business mind. Think about how our actions ripple throughout the community. Together we can create more value for everyone. 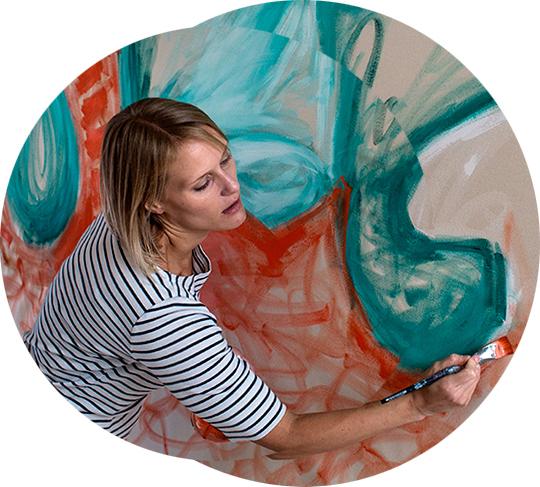 Beth Inglish is a contemporary abstract artist who uses line and color to create expressive work and channels the energy from her spirit to transform people and places. She is also the founder of the Nashville Creative Group, a community established to connect, support, and share with thousands of local artists instantly. The Nashville Creative Group is a community vibrantly active with artists, musicians, communicators, technologists, and activists. To learn more about how Beth uses creativity, connection, and community to change the world for the better visit her website or Beth Inglish Art. Plus, the benefits and drawbacks of each one. Dive deep inside the mind of an art buyer to learn how to sell more art. Having trouble getting into a juried show? Follow these 5 easy tips to impress jurors and increase your odds of acceptance.